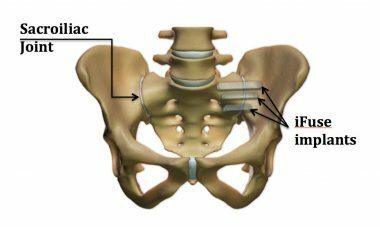 The sacroiliac joint is an under diagnosed pain generator. Until recently there were few successful permanent cures to this problem which did not involve considerable risk and invasive open surgery. Pain is often felt in the lower back just to the side of the midline at the level of the buttocks. 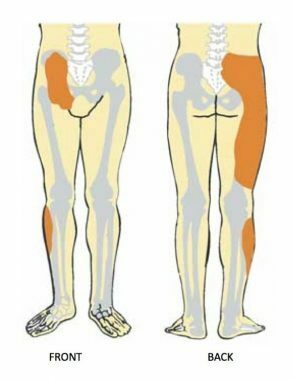 This pain can radiate down the back of the thigh to the knee and rarely to the side of the calf. Occasionally pain can be felt in the groin also. Pain can be aggravated by standing on that leg alone or going up and down stairs. The sacroiliac joint is a large joint between the sacrum (spine) and the pelvis, it is a joint and can therefore be irritated by arthritis or abnormal movements here. Arthritis is an inflammation of the joint which is often painful, there are multiple types of arthritis which can settle on this joint in particular osteoarthritis, and other inflammatory conditions such as ‘ankylosing spondylitis’ and other ‘seronegative arthropathies’ associated with bowel skin and eye conditions. Abnormal movements or pressure at this joint can occur due to having one leg longer than the other for whatever reason (developmental reasons, or previous surgery to the limb or spine). Or generalized ligamentous laxity, or previous pelvic injuries. Your consultant will take a history of the pain and examine you using special provocative tests to elicit the symptoms. Xrays and occasionally bone scans and MRI scans are requested also to help pin point the problem and help exclude other joints that can mimic the pain. Sometimes this gives longer term relief (anything up to 6weeks), if the condition is purely inflammatory it can be managed with anti inflammatory medications and injections. Physio therapy is offered those mild cases with girdle weakness, if this fails in the long term or the condition is more severe then we would consider fusion. This new system offered is a day case procedure done through a keyhole approach. Under X-ray guidance and regional anaesthesia up to 3 triangular shaped titanium rods are passed across the troublesome joint. These rods are rough and grip onto the bone either side of the joint, this renders the joint unable to move at all. 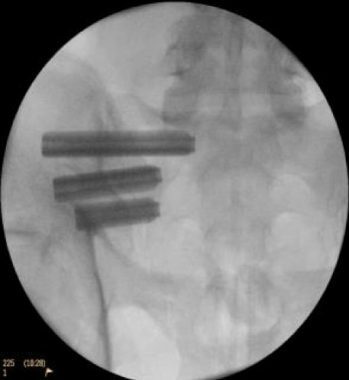 In the long term the bone grows onto the rods incorporating them and fusing the joint. 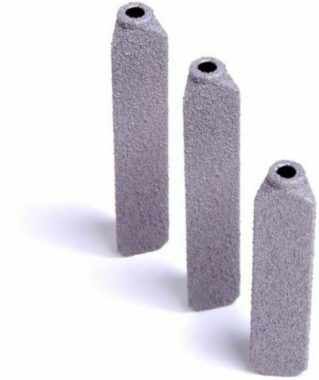 This minimally invasive approach drastically reduces the risks of bleeding, infection and pain compared to the more traditional methods of fusion allowing earlier weight bearing and discharge from hospital on the day of surgery. Every surgical procedure carries risks, the risks using this approach to joint fusion are dramatically reduced. 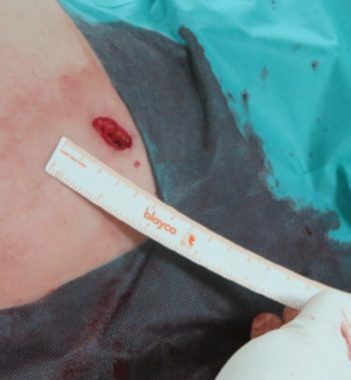 Infection: this is less than 1% and normally can be managed with antibiotics alone, rarely the implant may have to be removed if the infection is severe. Nerve injury: there is a risk of damaging the nerve roots near to the SI Joint these affect the skin of the side of the calf and foot and occasionally in severe cases may lead to a foot weakness, although this is rare due to continuous imaging throughout the procedure to ensure the dangerous regions are avoided. Failure: there is a risk that this may not cure all of your symptoms – as commonly other joints (spine and hip) can be also involved in generating your pain. Immediately after surgery you will be able to weight bear with a pair of crutches. You will be shown how to `put about 50% of your weight through the side that has been fused for the first 3-4weeks, then gradually weight bearing can increase to full as pain allows. You will be seen at 2 weeks to check the wounds and again at 6 weeks with an X-Ray to check the progress. Cycling should be avoided for 6weeks. Depending on the kind of work you do, you may need up to six weeks off work. However, you will be advised about this as everyone is different and your rate of recovery may be different from other people’s. We normally recommend that you don’t work at all for the first two weeks, gradually returning to normal after four to six weeks (if your job mainly involves sitting down). Commuting during rush hour is not recommended for at least six weeks after fusion surgery. Manual workers may need up to three months to return to normal.